Not many people know of Calvin Harris's earlier, more personality-based dance hits, but in a post-"We Found Love" world, Harris is telling us that bigger is better, even if it results in an album that sounds more anonymous and self-important than anything he's done before. All it took was three very simple words: "featuring Calvin Harris". Certainly, a few people were perplexed when they saw that affixed to the end of the song title "We Found Love", because the closer people listened to that Rihanna track, the more they realized that there is no male backing vocals to speak of. 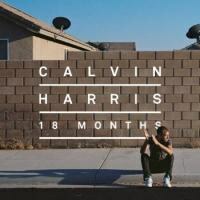 This "featuring Calvin Harris" bit was, in a rather bold move, simply referencing the producer as if he was right up there with the lead artist, but Harris had paid his dues, having released goofy, remarkably addictive pieces of dance pop on his own out in the U.K. At times his playful braggadocio worked (as on his excellent 2007 single "The Girls"), at times his desire for a big mainstream hit got the better of him (like on his odd "I'm Not Alone", although it was awful nice of Cobra Starship to pretty much nick the melody from him wholesale), but even with occasional penchant for melodrama aside, Harris was quickly establishing himself as a notable dance producer with one hell of a knack for an enjoyable mainstream melody. So while 18 Months, Harris's third solo full-length, is pretty much the hit-making monster that launched him in to the world spotlight, the truth of the matter is that it feels like a rather compromised vision of who he is an artist, sacrificing his quirkiness for a brooding new persona that starts to get stale over the course of a complete full-length. At times, his unique brand of four-on-the-floor soul searching can be quite effective, perhaps no greater than with the album's second single, the stunning "Feel So Close", which is Harris just by himself without any of his superstar friends. All he has is a simple piano melody, a basic beat, and some U2-styled guitar histrionics, but that's all he needs to create this undeniably sultry piece of club music, capable of climaxing your evening out on the dancefloor or soundtracking your scrolling through numerous thoughtful Tumblr photoblogs with equal effectiveness. Most importantly, though, it shows that Harris still remains capable of creating some striking music on his lonesome by playing with existing tropes and still managing to have the end result sound fresh. In fact, there are numerous examples of his ability to craft compelling melodies throughout 18 Months, ranging from the surprisingly minimal Kelis feature "Bounce" to extremely well-matched Florence Welch collaboration "Sweet Nothing", which never overplays its hand with rising climaxes, instead giving Welch a propulsive little groove for her to gradually coo out the lyrics of self-empowerment, the whole thing working because Welch doesn't overdo it and Harris is more than happy to give her the space she needs. The end result may not be as grandiose as that other indie-singer-turned-dance-diva revelation, but it proves that Harris won't be running out of great material anytime soon. Which begs the question: in saving tracks like "Feel So Close", "Sweet Nothing", and the incredibly effective closer "Thinking About You [ft. Ayah Marar]" for himself (the latter of which features a chord progression that's straight out of 90s house music, a nice little nod to dance music's long and storied past), what the hell is he doing the rest of the time? With his Tinie Tempah collaboration "Drinking From the Bottle", he does an amazing job of sounding exactly like Swedish House Mafia, and the aggressive, street-level track "Here 2 China" feels remarkably forced, as Dizzee Rascal absolutely obliterates Harris's beat without any help, his flow remarkably nimble, all wasted on a song that accomplishes very little aside from giving Rascal another great spotlight for his ferocious abilities. At times, Harris' collaborations simply don't work well at all, like on "I Need Your Love" wherein Ellie Goulding's thin voice comes off as weak, disinterested. Ne-Yo doesn't do much better on "Let's Go", because once the beat drops, the track basically evolves into a thinly-veiled rewrite of "We Found Love", sharing the same level of release despite a much more tepid songwriting effort surrounding the whole thing. It's a bit of an odd phenomenon, listening to 18 Months, because for all of the personality he has as a producer and songwriter, almost none of it comes into focus on this blockbuster of a disc. By going big, he ends up sounding anonymous, his distinct sense of playfulness relegated to only bits and flashes (like on the funky snippet "School", although that doesn't even top two minutes). Thus, as occasionally fascinating and often infuriating as 18 Months is, the end result leaves Harris at a distinct crossroads: does he sell his personality in exchange for big hits and big paydays or does he try to find some happy synthesis between his unique charm and obvious pop instincts? It's not a question that can be easily answered, but here's hoping we find out before we have to suffer through another 18 months of watered-down Europop ubiquity.